Sixers forward Dario Saric celebrates a three-point basket against the New York Knicks on Monday, February 12, 2018 in Philadelphia. 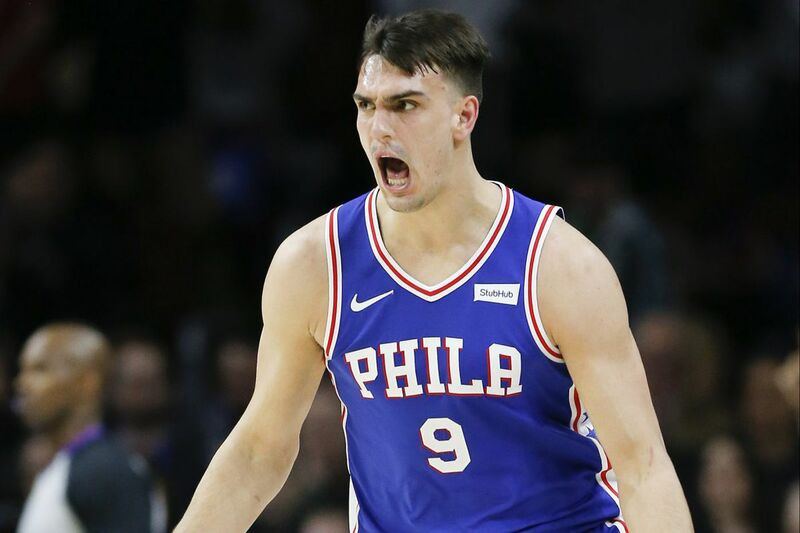 Dario Saric hit a three-pointer with 7 minutes, 18 seconds left in the third quarter of the Sixers 128-114 win over the Hornets Tuesday night in Charlotte. Less than minute before Saric's shot, the Sixers had just a five-point lead over the Hornets. Robert Covington, who was the standout player of the night hit a three to extend the lead to eight points, and after a scoreless Charlotte possession, Saric set a screen and popped out for an easy trey. That bucket prompted Hornets coach Steve Clifford to call a timeout. His players headed toward their bench while Clifford's arms slunk to his sides and he heavily exhaled. He saw the play coming a mile away, and the team should have too. Any scouting report on the Sixers is bound to have emphasis on two people — Joel Embiid and Ben Simmons. Saric doesn't walk in the same kind of spotlight as Embiid and Simmons, and the headlines aren't going to have his name in them on a nightly basis, but he is far from underrated when it comes to scouting the Sixers. On Friday the Sixers and Hornets met for the first time this season and Clifford said that Saric is someone that NBA coaches do not take lightly. "His name was brought up this morning," he said. "When we walked through stuff he was a guy that we talked about constantly. Guys like him are hard to find in this league." Saric currently ranks in the top 10 of NBA power forwards in points per game (10th), three-point percentage (7th), assists (6th), free throw percentage (1st), and total offensive rebounds (10th). "Saric to me is a winning player," Clifford said. "He's tough, he can shoot, he's a great rebounder, and he plays at both ends of the floor." Saric finished Tuesday night with 19 points on 7-of-11 from the field and 4-of-7 from three to go with five rebounds and three assists. Heading into Thursday's game in Miami, Saric has nine double-doubles, a 40-game streak of scoring in double-digits (Nov. 29 to March 1) and is the team's fourth highest scorer behind Embiid, Simmons, and JJ Redick. Before the season started, there were concerns about how the forward would fit into a lineup with Simmons. Saric has not only adjusted with very few hiccups, but he and Simmons have become a winning tandem. Of Saric's 326 made field goals this season 256 of them have been assisted, and Ben Simmons is responsible for 116 of those, which is 24.6 percent of Simmons assists this season. For context, T.J. McConnell has the second most assists to Saric with just 27. On Tuesday, in the Sixers and Hornets second meeting in five days, when Saric popped out to the three-point line and hit a dagger that forced a timeout, it was Simmons who delivered the pass. The Hornets and Sixers will face each other two more times over the final 20 games of the season. Clifford, along with the other NBA coaches who will come up against the Sixers, will have their hands full in planning not just for Simmons and Embiid, not just for Redick rolling off high screens for a three, and not just for Covington posing a solid two-way threat. Teams will have to plan for Saric, who is proving to be one of the most reliable and consistent power forward's in the league, who just happens to play with the leading rookie of the year candidate.